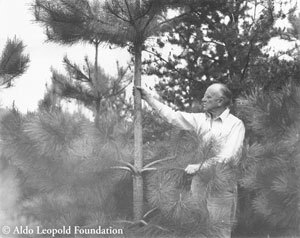 Published in 1949 as the finale to A Sand County Almanac, Aldo Leopold’s “Land Ethic” essay is a call for moral responsibility to the natural world. At its core, the idea of a land ethic is simply caring: about people, about land, and about strengthening the relationships between them. Fundamentally grounded in values, ethics are a moral sense of right and wrong. Ethics are demonstrated by the way people live their lives: When a person cares about someone or something, their actions convey that care and respect, and invite the same in return. What is a Land Ethic? In Leopold’s vision of a land ethic, the relationships between people and land are intertwined: care for people cannot be separated from care for the land. A land ethic is a moral code of conduct that grows out of these interconnected caring relationships. He believed that direct contact with the natural world was crucial in shaping our ability to extend our ethics beyond our own self-interest. He hoped his essays would inspire others to embark or continue on a similar lifelong journey of outdoor exploration, developing an ethic of care that would grow out of their own close personal connection to nature. We are all part of the thinking community that needs to shape a land ethic for the 21st century and beyond. To do that, we must engage in thoughtful dialog with each other, inviting a diversity of perspectives, experiences, and backgrounds. Together, we can form a land ethic that can be passed down to future generations. The Aldo Leopold Foundation’s popular two-day Land Ethic Leaders program equips participants to connect wider audiences to Leopold’s land ethic, and helps them deepen their own understanding of this idea through dialog about the meaning and value of conservation.